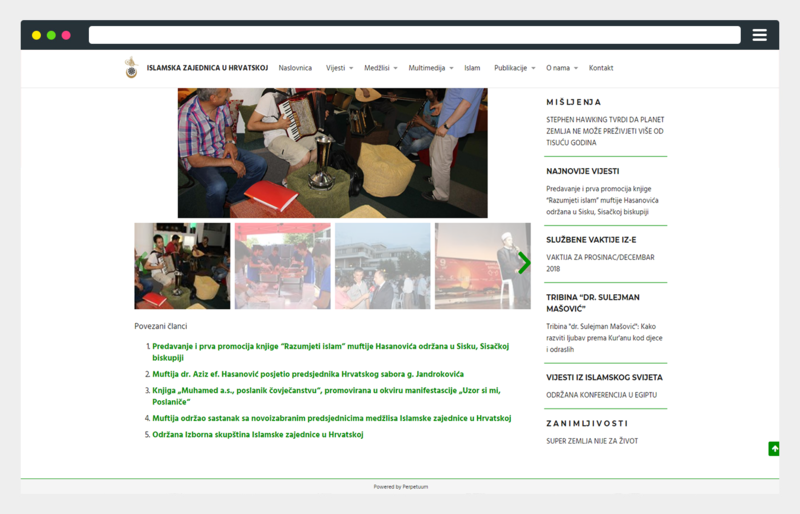 Islamic Community in Croatia - New website for another 100 years! Perpetuum designed and created a website for the Islamic Community in Croatia that facilitates the communication between believers and their community, but also provides every visitor with important information about the Islamic Community in Croatia. The Islamic Community in Croatia has been operating for more than 100 years as a public, unique and independent religious organization of citizens who freely confess their faith to Islam. Such an important anniversary required a new, modern and updated website so that believers and everyone who wishes to find out more about the Islamic community can find all the information in one place. What connected Perpetuum and the Islamic Community? Well, first of all, the desire to create a “place” where the Islamic Community in Croatia will be encouraged the work will be promoted and where Islam would be taught. 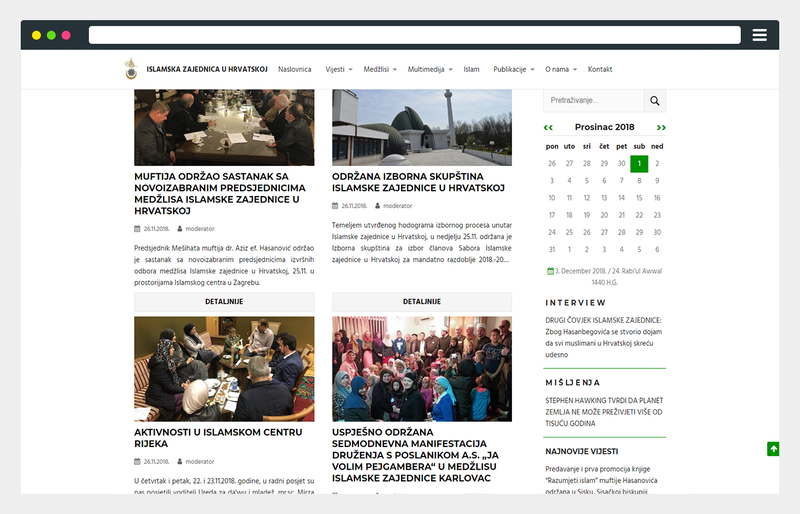 The new Islamic Community website is designed as an informative site where visitors can get information about the life of believers of Islamic faith in Croatia and the world, activities of Islamic community representatives, as well as basic information about Islam. In order for the whole system to function flawlessly for visitors as well as administrators in the Islamic community, a iSite Open solution based on the Drupal CMS was selected. This proved to be a good choice, particularly in the situation when more than 3000 texts from the old WordPress site needed to be migrated to the new one. Using a custom built Drupal module we enabled automatic migration of old texts to the new system. The client now has a well-structured archive, a foundation on which they can continue building their important body of knowledge. A new, easy to navigate and simple page layout has been designed and at the same time, it ensures an easy option of entering and editing of content. Also, Drupal CMS allows further upgrading of the system in the future which would meet the needs of the Islamic community in the next 100 years. Our community seeks to develop its openness and transparency in acting through the presentation of its work and activities to the general public. Due to many obligations and lack of time the simplicity when using the site, ease of publishing content, as well as the stability of the whole system is the key. We achieved exactly that when working with Perpetuum, now working in the advertising and information segment is easier, and the customer service is at a higher level.